Brush Edge is the artist in the family - the one whose finishing touch makes everything look just right. Part of a collection of styles that feature decorative edge treatments, Brush Edge starts with beautifully blended hues of color on a softly woven background - like the subtle texture of canvas visible beneath a painted surface. Your photo or artwork is uploaded into a window overlapped by a fun dash of color, as if someone whisked a brushstroke of paint lightly across the edge of glass. 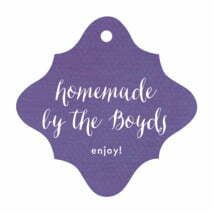 Simply styled but with a touch of artistic flair, Brush Edge is offered with a variety of fonts and over 20 rich colors to choose from, plus space for an uploaded image, making it super easy to personalize for all your clever creations and celebrations. 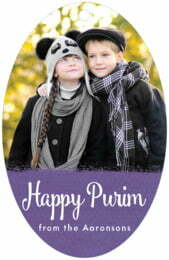 Customize your Brush Edge purim tags today! Brush Edge Purim tags are printed on extra-thick cover weight white paper and come in a variety of shapes and sizes (including diamond, circle, ovals, and other more intricate shapes). Purim tags come pre-punched with a small round hole to thread your choice of tying material. They are punched out individually and packaged as a set in small bags. Choose a shape and color above to start customizing your Brush Edge Purim tags today!